Haddam Selectman Melissa Schlag knelt during the Pledge of Allegiance at a Board of Selectman meeting last week. She said it was in response to President Trump's controversial comments in Helsinki on the Mueller investigation and Russian election interference. A town official in Haddam, Connecticut, is facing criticism after kneeling in protest during the Pledge of Allegiance during a public meeting. 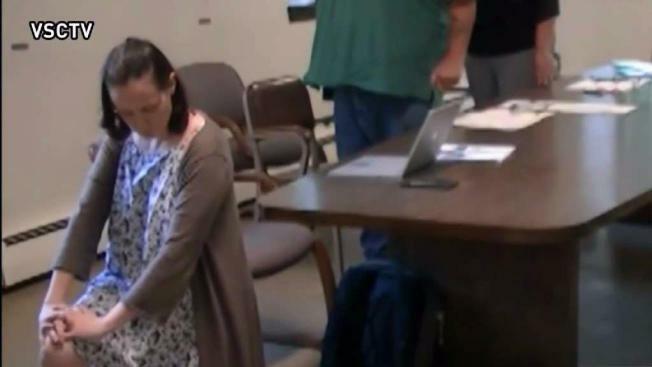 In video obtained by NBC Connecticut, Haddam Selectman Melissa Schlag is seen taking a knee during the pledge of allegiance during a town Board of Selectmen meeting on July 6, hours after President Trump’s controversial comments in Helsinki on the Mueller investigation and Russian election interference. “I thought, ‘no better time’ to protest what’s going on in our country than that evening at a Board of Selectmen meeting,” Schlag told NBC Connecticut. Her decision to kneel, she explained, was not in disrespect to veterans or the flag, but was instead her response to the president’s leadership. “We have fundamental problems in our country. Inequality is only one of them,” she said. Schlag, a registered Democrat who is chair of the party’s town committee, was elected to her position this past November two years after losing a re-election bid to lead the town as first selectman. Haddam’s current first selectman, Republican Lizz Milardo, who won the position from Schlag, believes her former opponent's views should be kept out of town business. “Her personal opinion and her personal protest I don’t feel belongs at one of our town meetings,” Milardo said. Residents and non-residents of Haddam are complaining to the town hall, according to Milardo. “I can’t believe the emails we’ve gotten, the phone calls we’ve gotten,” she said. Milardo said the town’s next Board of Selectmen meeting will be moved from the town hall to a nearby firehouse to accommodate a larger crowd expected to turn out over the issue. To Schlag, the negative feedback to her protest is evidence of a deep political divide. “The vitriol that has been displayed on Facebook over the past two days, and on my Selectman page across Facebook, is proof that this country is so divided, but screaming at people from behind a keyboard does not get us anywhere,” she said. She said she intends to continue kneeling for the Pledge of Allegiance in future meetings.